One of the most repulsive aspects of the manifestation of the perfect of the inherent degeneracy of conciliarism’s false doctrines that we are eyewitnesses to in this remarkable moment in the history of salvation as Holy Mother Church lives out the mystical burial of her Divine Founder, Invisible Head and Mystical Bridegroom, Our Blessed Lord and Saviour Jesus Christ, is the extent to which they have made it necessary for those who, despite their own sins and failings, seek to defend the Holy Faith to comment on the sewage of heresy, blasphemy, sacrilege, impurity, perversity and vile embrace of every manner of sin imaginable. What is worse yet is the consideration that there will be widespread dissemination of the details of sins that cry out to Heaven for vengeance now that Jorge Mario Bergoglio’s “synod of bishops” on the family has commenced. I, for one, am not going to offer commentary on every interview that every “bishop” or peritus (expert adviser) gives prior to the weekly summary of events that will be provided by the spinmeisters at the Press Office of the Holy See. It will be enough to offer a summary at the end of each week’s sessions to provide empirical proof of the fact that the participants in these so-called “synod,” which has been convened by an antipope who is the head of false religious sect that is but the counterfeit ape of the Catholic Church, have lost all sense of even a generic sense of moral decency in addition to having lost the Catholic Faith long, long ago. What is sadder yet is that some of the participants in Bergoglio’s synod are young enough to have never had the Catholic Faith at any point in their lives, having been fed the filthy lies of conciliarism from the time they entered a conciliar school or took religious miseducation classes in a parish. There is no need to descend once again into the muck and mire of the details about Godfried Danneels or Walter Kasper, or Timothy Radcliffe or Christoph Schonborn or almost the entire membership of the Swiss and German conciliar “bishops’” conferences, et al., to demonstrate that the currently ongoing “synod of bishops” is all about reaffirming unrepentant sinners in their lives of natural and/or unnatural vice. Most of those participating, save for a handful of “conservative” revolutionaries who will be seen by anti-sedevacantists as “defenders of Catholic Faith and Morals” despite the fact that they support the false doctrines of conciliarism and have offended God greatly as a result (see No Good Guys or Bad Guys, Just Shades of Revolutionaries), do not believe in the inerrancy of Sacred Scripture or, of course, in the immutability of God and His Sacred Deposit of Faith, making them relativists in the doctrinal, moral, pastoral and philosophical realms. The synod is a celebration of sin in the name of “mercy,” “love,” and “compassion” by those who are men of sin. “Notwithstanding the respect due to the events and personal situations”? Demands made for the open recognition of the “virtues” of sodomite relationships that many conciliar “bishops” have said openly contain “elements of true love” and are worthy of respect? 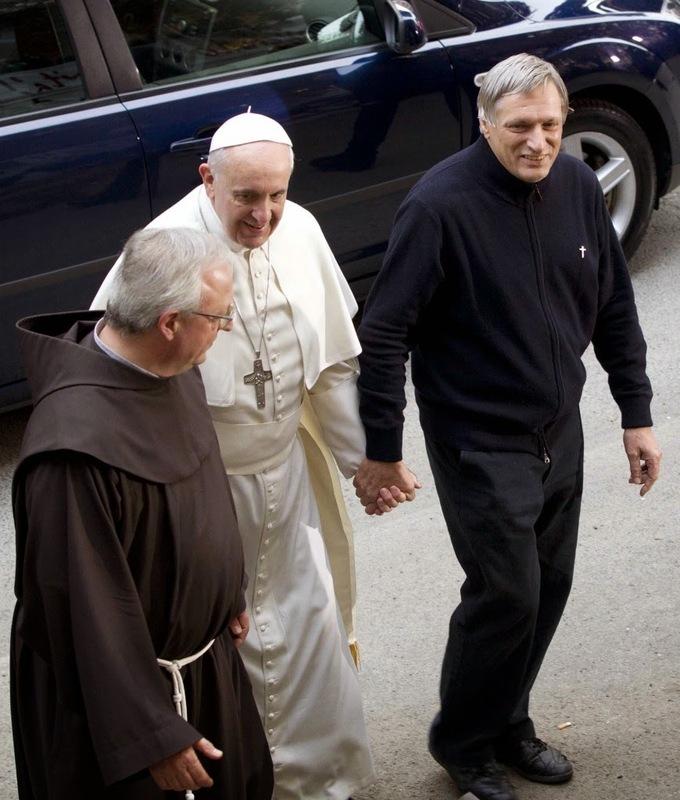 A supposed “monsignor’s” revelation that he has a “partner” in perverted vice? "To Father Lombardi, who defines as 'not trustworthy' what was published regarding Msgr. Ricca, L'Espresso replies reaffirming point by point the facts referred by Sandro Magister in his piece, confirmed by several primary sources and, as a whole, considered at the time of such gravity by the same Vatican authorities that forced them to remove the Monsignor from the Uruguay nunciature, in which he rendered his service, giving scandal to bishops, priests, religious and lay persons in that country. This sequence of events, which unfolded in July of 2013 as Jorge Mario Bergoglio was preparing to journey to Rio de Janeiro, Brazil, for "World Youth Day" and prompted him to exclaim "Who am I to judge?" when asked about the matter on his flight back to Rome on Monday, July 29, 2013, was one of the few times that I could empathize with Sandro Magister as I know all about trying to convince those who do not want to see the plain evidence before their eyes in such cases. Fortunately, however, everything does get revealed on the Last Day at the General Judgment of the living and the dead, and those who “spun” their stories in this will realize that their supposed “vindication” here is not going to help them at that time if they persist until the end in their shooting the messenger. Death, not "respect," "brotherhood" and "mainstreaming" for the sake of "inclusivity," was what Pope Saint Pius V, faithful to the teaching of Saint Paul the Apostle in his Epistle to the Roman cited above, believed should be imposed on the clergy as well as the laity who were caught in "such an execrable crime" that caused him "such better sorrow" shocked his papal mind as he sought to "repress such a crime with the greatest possible zeal." Jorge Mario Bergoglio and others in the conciliar structures want to provide "respect," "brotherhood" and "acceptance." Just a slightly different approach, wouldn't you say? A false "pope"seeks to appear as an agent of mercy when he is actually an apostle of eternal death. It is shameful that anyone would seek to provide a cover for a man who has such disregard for the honor and glory and majesty of the Most Blessed Trinity and who seeks to indemnify sinners in the name of what is nothing other than a false mercy. Those five little words, "Who am I to judge? ", helped the Homosexual Collective within the structures of the counterfeit church of conciliarism and in the world-at-large to advance their agenda of perversity in the name of "toleration" and "compassion" and "diversity" with more and more boldness. Recently, of course, it was revealed that Bergoglio met and embraced with great, joyful enthusiasm a former student of his from Argentina who has been living in a sodomite relationship with another man for nineteen years (see Polluting the Atmosphere With the Smoke of Antichrist, part nine). Krystof Olaf Charamsa simply had his timing off as his statement and video served as a "spoiler" for the ongoing synod's predetermined, precooked results. Thus it is that the men who have gathered for the “synod of bishops” want to make provide unrepentant sinners, including those who are divorced and civilly “remarried” without a decree of conciliar nullity, outright fornicators, abortionists and those who engaged in perversity, to approach what purports to be Holy Communion in the Protestant and Judeo-Masonic Novus Ordo liturgical service, and “Father” Federico Lombardi, S.J., will be on hand to tell us how the conciliar world is “spinnnnnnning tonight” (apologies to the late liberal former Missouri congressman and radio commentator George Hamilton Combs, see Remembering the Spinning World of Mr. Combs). In other words, the synod “fathers” from hell believe that it is not necessary to have the wedding garment of Sanctifying Grace in order to receive what purports to be Holy Communion and that there is no contradiction between living in sin, whether natural or unnatural, and being a “good Catholic” who is “deserving” at being “fed” in the Novus Ordo banquet hall. 1. “Give peace, O lord, to them that patiently wait for Thee,” we prayed last Sunday (Introit). Today we receive the answer of the Lord: “I am the salvation of the people” (Introit). Then before our eyes the gates of heaven are opened, and we see the immense throngs which move forward in an unbroken procession toward heaven. To all these who are called He will bring salvation. 2. The hall of the marriage feast is open, the banquet is ready. For us this means the sacrifice which is prepared at this hour at the celebration of the Mass. The banquet hall is the Christian Church. At Mass, the Lord (Christ) enters the hall and goes about to welcome His guests, to espouse their souls as His bride in an intimate union of prayer and sacrifice. But in order to take part in the banquet it is not enough that one merely enter the hall, that one is baptized; it is essential that one possess also the wedding garment, “the new man who according to God is created in justice and holiness of truth” (Epistle)—freedom from sin and a disposition to obey the commandments of God (Communion). This parable issues a serious warning to all of us who wish to offer the Mass with the priest. It must be our serious endeavor to be “prepared in soul and body . . . [to] perform the works that are Thine” (Collect). Therefore the Epistle admonishes us: “Be ye renewed in the spirit of your mind and put on the new man who according to God is created in justice and holiness of truth. Wherefore, putting away lying, speak ye the truth every man with his neighbor, for we are members of one another. . . . Let not the sun go down upon your anger.” Such is the wedding garment, the new man. He who does not wear this garment, cannot take part in the banquet of heaven. He may have a found a place on earth in the hall of the Church, but when the King comes (for judgment at the last day) He will ask: “Friend, how camest thou in hither, not having on a wedding garment?” And then He will command His waiters” “Bind his hands and feet, and cast him into the exterior darkness” (Gospel). The return of Christ at the end of the world will bring the separation of the cockle and the wheat. 1. The liturgy today leads us into the brilliantly lit and festively decorated banquet hall, which is thronged with guests dressed in resplendent wedding garments, awaiting the arrival of the King. The hall is the Church; we, the baptized, are the guests. The wedding garment is the garment of sanctifying grace. We are all waiting for the arrival of the Lord, the King. 2. “Be ye renewed in the spirit of your mind and put on the new man, who according to God is created in justice and holiness in truth” (Epistle). The nearer the day of the return of the Lord approaches, the more insistent become the admonitions of the Church: “You know not the day nor the hour” (Matt. 25:13). “As in the days of Noe, so shall also the coming of the Son of Man be. For as in the days before the flood they were eating and drinking, marrying and giving in marriage, even till that day in which Noe entered into the ark, and they knew not till the flood came and took them all away; so also shall the coming of the Son of Man be. . . . Watch ye, therefore, because ye know not at what hour your Lord will come” (Matt. 24: 34 ff.). The Church wishes that we that we be ready when the Lord comes at the hour of our death. We shall be ready if we wear the wedding garment of sanctifying grace. We shall be ready if we renew our inner disposition, if at each Mass, at each Holy Communion, at each sincere prayer, at each stimulation of grace, we put on the new man in our thoughts, our judgment, our will, and our actions. “The kingdom of heaven is likened to a king who made a marriage for his son. . . . And the marriage was filled with guests. And the king went into see the guests, and He saw there a man who had not a wedding garment, and he saith to him: Friend how camest though in hither, not having on a wedding garment? But he was silent” (Gospel). It is not sufficient that we have come to the banquet hall of the Church; a wedding garment is also required. It is not enough that we have received baptism and have accepted the Christian faith; we must live according to the gospel; we must live a life of justice and holiness; we must possess sanctifying grace and Christian virtues. “Wherefore, putting away lying, speak ye the truth every man with his neighbor, for we are members one of another. Be angry and sin not. Let not the sun go down on your anger. Give not place to the devil. He that stole, let him steal no more, but rather let him labor, working with his hands the thing which is good, that he may have something to give to him that suffereth need. Let no evil speech proceed from your mouth, but that which is good, to the edification of faith, that it may administer grace to the hearers. . . . Let all bitterness, and anger, and indignation, and clamor, and blasphemy be put away from you, with all malice. And be ye kind one to another, merciful, forgiving one another, even as God hath forgiven you in Christ. . . . But fornication and all uncleanness or covetousness, let it not so much as be named among you, as becometh saints (Eph. 4:25-29; 5:3). 3. The wedding banquet to which we are invited is Holy Communion. But the Apostle gives us a grave warning: “Therefore whosoever shall eat this bread or drink the chalice of the Lord unworthily, shall be guilty of the body and of the blood of the Lord. But let a man prove himself, and so let him eat of that bread and drink of the chalice. For he that eateth and drinketh unworthily, eateth and drinketh judgment to himself, not discerning the body of Lord (I. Cor. 11:27-29). The wedding to which we are invited is the blessed possession of God. “That My joy ay be in you and your joy may be filled” (John 15:11). We will be granted admission to the eternal banquet only if we are clothed in the wedding garment of sanctifying grace and have overcome every fault of our former lives, having done full penance for our sins, either in this life or in purgatory. With the liturgy during these weeks we long for the wedding banquet of eternal life. We put on the new man; we strive for perfect for perfect charity in all our acts. Almighty and merciful God, in Thy loving kindness shield us from all adversity, that being prepared in soul and boy, we may we free minds perform the words that are Thine. Through Christ our Lord. Amen. 1. The Church now looks forward to the end of time. In those days “shall many be scandalized and shall betray one another and shall hate one another. And many false prophets shall rise and shall seduce many. And because iniquity hath abounded, the charity of many shall grow cold” (Matt. 24:10-12). The Church will be ridiculed, derided, and persecuted. She will await in her white garments the coming of the Lord. She looks up to Him, and He reassures her: “I am the salvation of the people, saith the Lord; in whatever tribulations they shall cry to Me, shall I hear them; and I will be their Lord forever”. . . .
3. As long as we hold fast to Christ, our salvation is assured. Separation from Christ means the loss of our salvation. If we refuse to accept His doctrine, if we refuse to obey His commandments, if we refuse to follow His counsels, if we fail to cooperate with the operation of His grace in us, we shall not be saved. Only when we give ourselves to Him completely will He work in us the fullness of our salvation, the fullness of His grace and blessing. Christ desires our entire being. “I am the salvation of the people.” We place our complete trust in the salvific will of the Savior for all sinners, for He will give us salvation. In this we place our confidence in spite of our many infidelities, in spite of our half-heartedness in spite of our frequent misuse and neglect of grace. Great as is our sinfulness and our need, greater still is His mercy, His love, and His will to save. For this reason we approach the Holy Sacrifice with great courage and confidence. “If I shall walk in the midst of tribulation, Thou wilt quicken me, O Lord; and Thou wilt stretch out Thy hand against the wrath of my enemies; and Thy right hand shall save me” (Offertory). This is a time for us to make reparation to Our Lord as His consecrated slaves through the Sorrowful and Immaculate Heart of Mary, especially by praying as many Rosaries each day as our state-in-life permits during this month of Our Lady’s Most Holy Rosary.